We recently moved Tyler Lee into the bigger bedroom to make it a better space for him to both sleep in and play in, a real toddler room if you will. 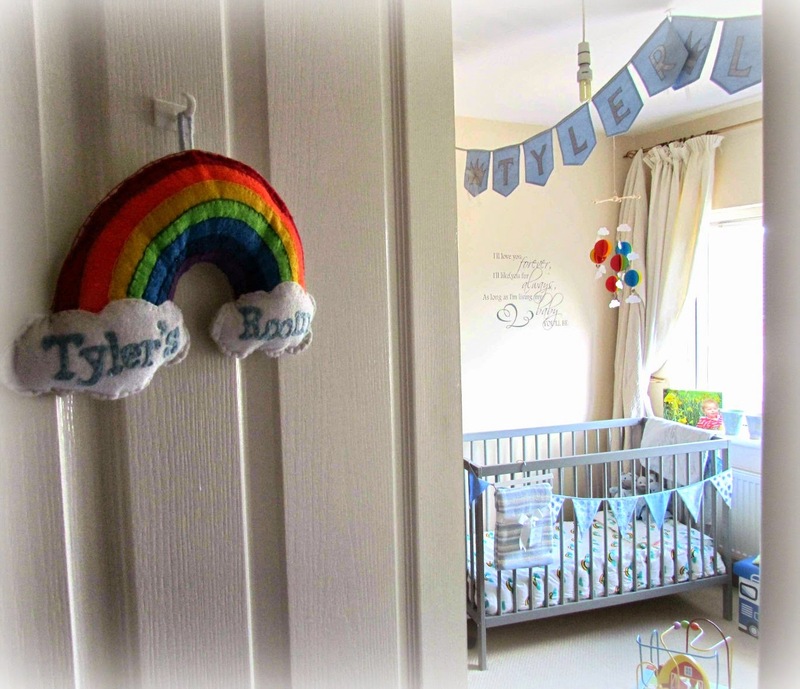 We wanted the room to be colourful, fun and whimsical for him and decided on a mish-mash theme of rainbows, book quotes, baby blue and everything else we saw that we liked. I think the mish-mash of themes adds to the overall fun and whimsical vibe we were going for, I wanted every corner of the room to have something exciting for Tyler Lee to look at and explore. His room in not yet completed, I need to get new blackout curtains, a new lampshade, a rug and some other decorations but I wanted to show you all some pictures of his room so far as I think it's really starting to come together and I will then do an update when his room is fully completed, although I don't know if it ever will be as I keep seeing gorgeous things on Etsy! As we live in a rented property I was unable to paint the walls in a colour I liked to I unfortunately had to keep it the magnolia colour it is but at least it's bright and airy. We also had to keep the wooden furniture, I would have prefered white furniture for his room but I just had to work with what we have. His room is a good size now and seems even bigger as he was moved from the tiny box room. It has a huge window which lets in a lot of light. 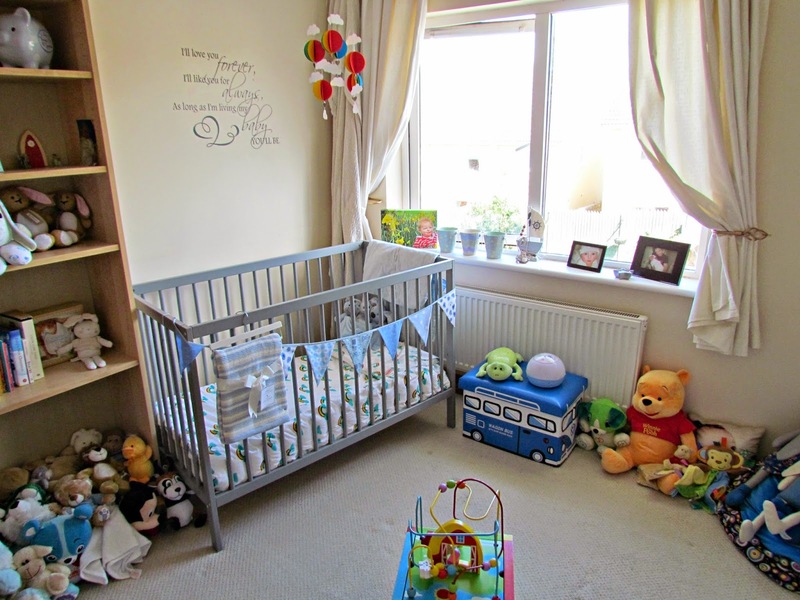 I thought the room looked quite sparse when I but everything up against the walls so I put the cot at a bit of an angel so Tyler Lee can look out the window, something he really enjoys doing. I also put his activity cube in the middle of the room until I get a rug. This is the space above his cot, the decal is from one of my favourite books to read to him, even though it makes me cry every time I do, 'Forever' by Robert Munsch. I say this quote to Tyler Lee quite often and I thought it was a sweet and very true thing to add to his room. To keep with the rainbow theme I saw this beautiful hot air balloon and clouds mobile on Etsy and just had to get it for him. It's made of paper so the hot air balloons float around every time a bit of breeze enters the room. Tyler Lee loves looking up at this mobile as he's drifting off to sleep, it makes him smile sweetly to himself, it's so adorable to see. This decal is on the opposite wall to the cot and is another book quote. This one is from 'Guess How Much I Love You' by Sam McBratley, another of my favourite books to read to Tyler Lee. This area will be the relaxing/reading corner for when Tyler Lee is a bit older. Right now it houses his beanbag and some cushions which his granda got him for his birthday. I'll be adding a teepee play tent and shelves to this area but that won't be for awhile yet. Going across the whole ceiling in his room is the beautiful royal flag bunting which we got made from Chloris Boris. It's such a feature in the room and I'm delighted that it was the perfect length for the ceiling. We got rid of Tyler Lee's old wooden cot when he moved into the big room, something which I'm kind of regretting but for now he's in the MoKee Mini Cot which is supposed to be a teal colour but it more of a grey colour to me. This cot can be turned into a cot bed but I think we'll be buying him a proper toddler bed instead. I decorated it with the same bunting which hangs above his reading/relaxing corner. 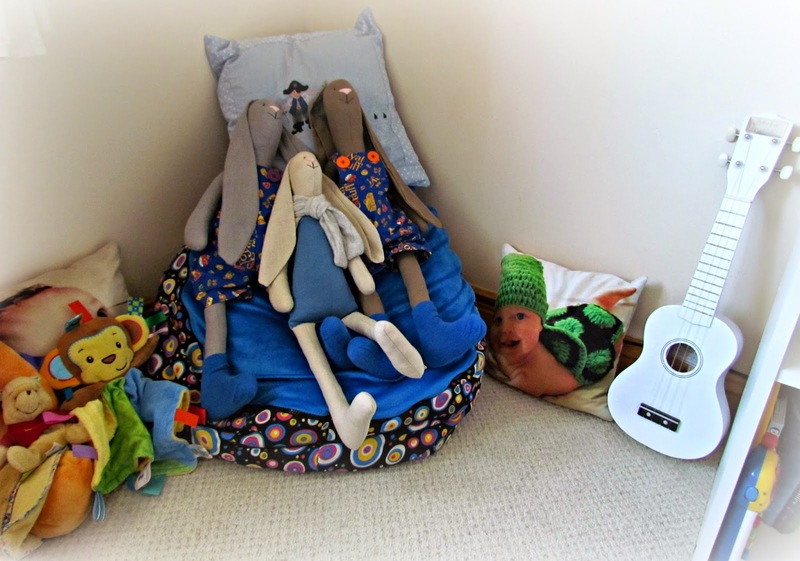 This is his beautiful rainbow bedding, the item which started the whole rainbow theme really. It's actually for a proper toddler bed but I just tucked the excess fabric into the sides of the cot and it works fine. Of course his three favourite comforters are always in his cot. I picked up the three metal buckets in Aldi, they're actually Easter egg hunt pails but I'm going to put chalk, crayons and markers in them when Tyler Lee is a bit older. I also put his canvas on display and some pictures of him and his daddy. Above his chest of drawers are some angel postcards in a frame which I thought were really sweet, these were in his nursery too. His bookshelf houses everything which is a bit delicate such as his christening gifts, fairy door, nightlight, handmade toys, books and cuddly toys, everything has it's own space and I just have to keep it neat and organised even though Tyler Lee has a penchant for pulling out all the books and soft toys! His room isn't completely finished yet but it really is starting to come together and when I get the last couple of pieces it will be perfect. 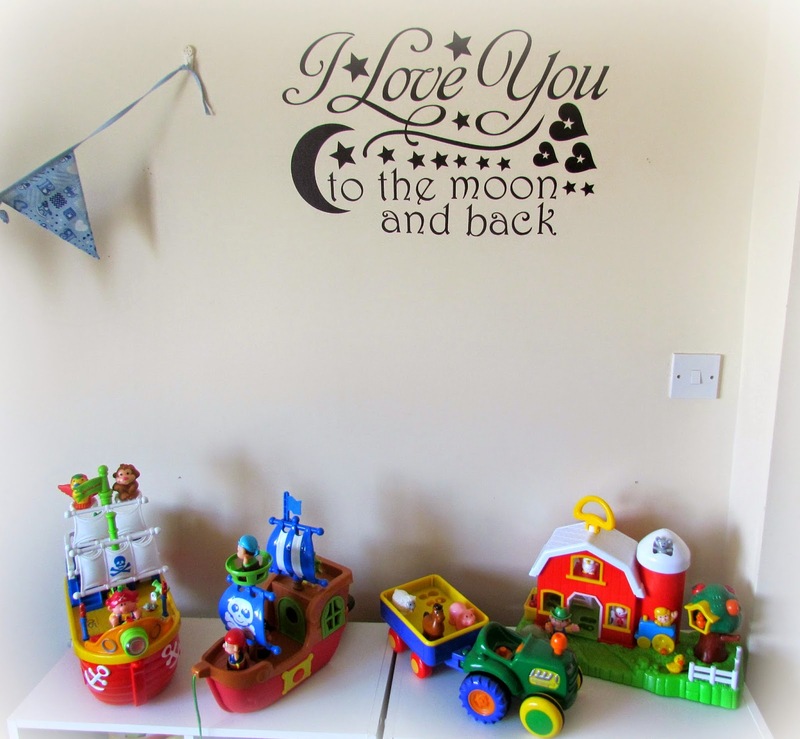 What do you think of Tyler Lee's toddler room? I'd love to see links to your own home decor/toddler room posts in the comments. This looks so cute. Well done you for making it look so fabulous! Hi Laura, there is a source list at the end of my post. It's from Lulu and Nat. 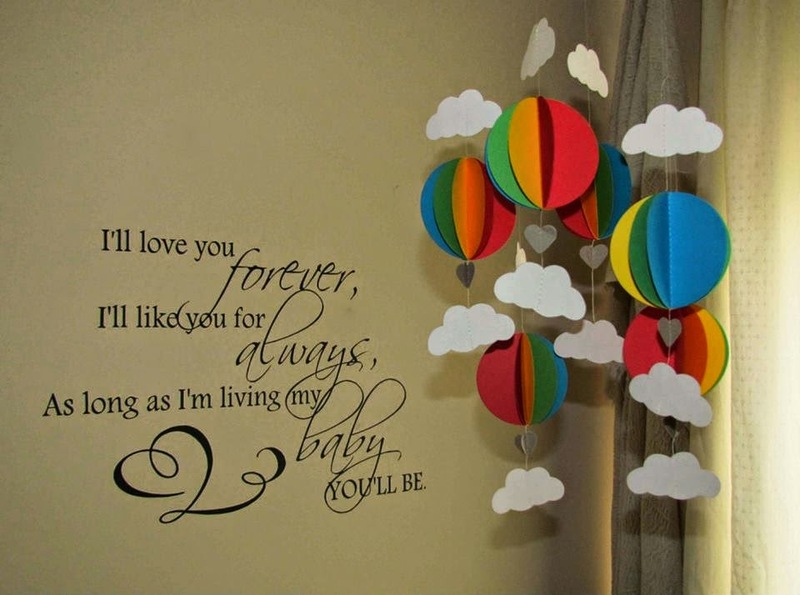 So cute and I love the balloon mobile. I like that you've gone a bit eclectic in the room... lots of interesting things to see and do. it's special! congrats! lovely, lovely, lovely! It`s lovely, i like the balloon mobile. Awww, I love his room! And I really love the colour of the cot, I think it's so nice - very scaninavian. Thank you so much for featuring my prince bunting! My particular favourites are the rainbow hanging sign you have on his door and the hot air balloons mobile. The boy is growing!